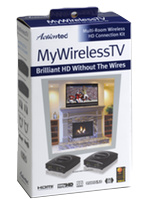 With Actiontec's MyWirelessTV system, you can watch HD television in any room in the house. This easy-to-use wireless HD video kit wirelessly transmits HDTV throughout the home, so you can put your HD television wherever you want, without having to worry about HDMI cables. The MyWirelessTV Kit contains everything you need. Simply connect the transmitter to any set top box, gaming console, DVD player, or other device and connect the receiver to any HD display in the home. And that's it. 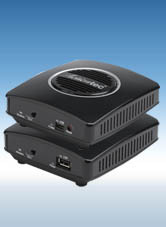 You can instantly distribute HD 1080p60 video.